Have you noticed all the great tips everyone has shared in their process of making the Bead-on-a-String block? I thought I’d pull them together in this post for anyone who is looking for more information (and visual aids) for making this block. Andrew shared a link to a very detailed YouTube video which walks through the appliqué method that I call faced appliqué, How to Do Almost Invisible Appliqué by Machine. You might want to make yourself a coffee or cup of tea before you begin, it’s almost 21 minutes, but chock full of good information. You can find an abbreviated summary of the technique on my blog, here: Faced Machine Appliqué. I used a fusible (on one side only) interfacing so that once the appliqué was prepared, it could be fused into place on the background fabric. Ellen linked to a post on her bog where she showed how she uses glue stick to hold the prepared appliqué in place on the background. 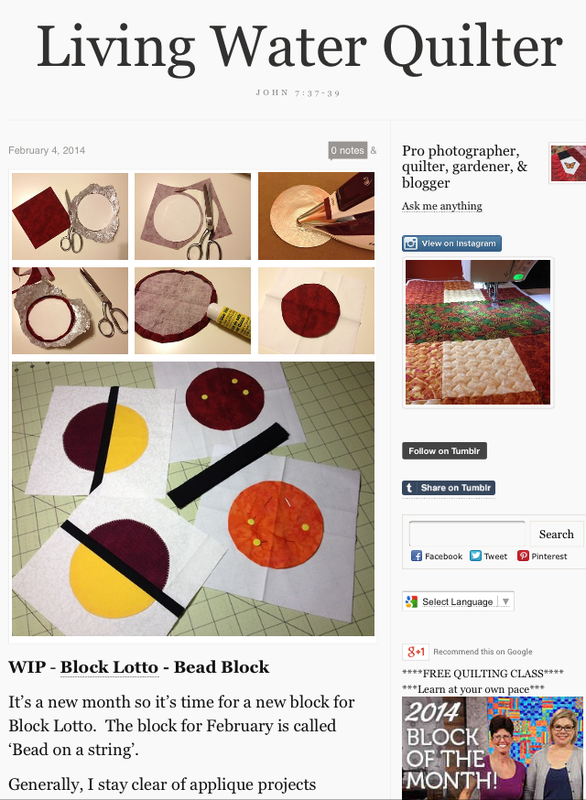 Dena hasn’t posted her blocks here yet, but I noticed that she shared a video and photos of how she prepared the circle for appliqué using kitchen foil and no running stitches on her Living Water Quilter tumblr yesterday. See her WIP Block Lotto Bead Block entry to see How to Make Perfect Circle Appliqué Circles with Karen Fielke and how it worked for Dena. When we made circle blocks in the past, I have usually included the note that you may inset the circles into the background and piece them, but I think only one person ever tried it, so I didn’t mention it this time … and then when Jude posted her first blocks, she mentioned using the EZ Circle Cut Ruler by Sharon Hultgren. Clicking the image will take you to Amazon, where I found it available online. When I went looking for an image to share, I realized I used to own one of these … I’m so glad I forgot to ask about it when I was in a quilt shop on Monday. I am not sure where mine is, but, I will likely hunt it down and try a few this way. 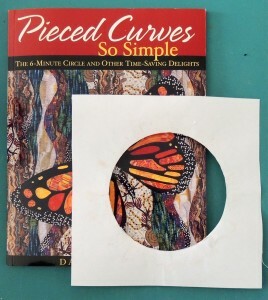 Jude’s post reminded me of another technique for piecing circular and other shapes and Dale Fleming’s 6-minute Circle. Last night I made three more blocks using her method, for which you make a template from two sheets of freezer paper ironed together and glue stick. Here’s the book I used and the template I made–it’s an 8 inch square with 5 inch circle hole in center–to make three more Bead-on-a-String blocks using the 6-Minute Circle technique to piece the circles into the background. If you google Dale Fleming 6-Minute Circle you’ll find links to Dale Fleming demonstrating her technique on Simply Quilts (on HGTV site) and a longer version (with other shapes and examples) from her on The Quilt Show (if you are a member) and lots of bloggers blogging tutorials about the technique. The book contains a lot of information on color and design principles and how to use the technique with different shapes. It was published almost 10 years ago, but I noticed that Amazon has it available on Kindle. Clicking the book image will take you there. If you shared a tip for making our bead block and I didn’t include it, let me know and I’ll update this post.